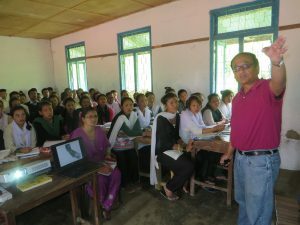 Earlier this month, Dr. Shrestha returned from his 2nd F2F trip with Winrock in Nepal , where he completed two assignments: one focused on developing a weed science program for the Agriculture and Forestry University (AFU), and another providing training for faculty and students at Uttarpani Technical School (UTS) Dhanakuta and Central Campus of Technology (CCT) Dharan on grant writing, experimental design, and data analysis. 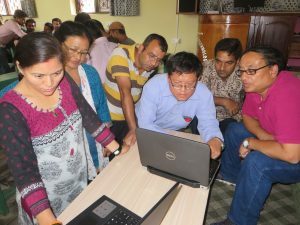 “On a personal level, being one of the very few weed scientists of Nepalese origin, I am extremely grateful for having had the opportunity to volunteer in Nepal and contribute to the development and initiation of a weed science program at the Agriculture and Forestry University (AFU). I also had the opportunity to interact with the young minds and was impressed by their enthusiasm and thirst for knowledge. Being originally from Nepal, one of my personal dreams was to start a weed science program in Nepal, and clearly, had it not been this opportunity offered by Winrock/F2F, it would have probably been impossible to accomplish this desire. Nepal definitely needs such type of assistance, and the impact also seems to be immediate. Of course, it will be interesting to see the long-term impact. People were very, very receptive and eager for the information that I took to them. They participated a lot. It was good to see that I was able to bring some changes there, even during the short duration of the assignment. The weed science curriculum that I developed went through the curriculum committee and university academic council and was adopted right away. AFU will implement it starting in January. Also, with the faculty and students that I trained at UTS and CCT, I was able to see a change right away in how they handled data during and after the training. Farmer-to-Farmer volunteer Michael Lowery is a long-time entrepreneur living in Colorado Springs, Colorado. 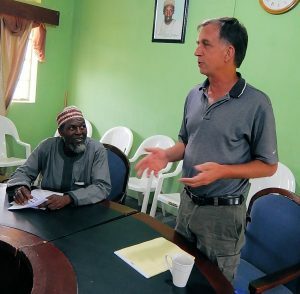 He just completed his 6th volunteer trip for Winrock since 2003, and his 2nd volunteer trip to Nigeria. 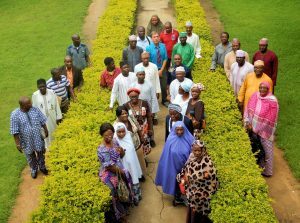 “My Winrock Farmer-to-Farmer volunteer assignment was a trip to Zaria, located in the state of Kaduna, Nigeria, located about 150 miles north of the Nigerian capital city, Abuja. The objective of the assignment was to teach grant writing to the faculty of Samaru College of Agriculture, which is one of the three colleges comprising the Ahmdu Bello University, part of the federal university system in Nigera. As a result of political turmoil and the decline in oil prices, the College hasn’t received operating funds or faculty salaries for an extended period. Prior to departing for Nigeria, I used my experience in project development and grant writing to produce powerpoints and handouts to train the SCA faculty and administrators in the art of developing projects that are interesting to foundations and funding agencies. I also included sample grant proposals, outlines for grant proposals, and templates for project budget spreadsheets, all useful guidelines I could leave with the participants at the end of the assignment. This being my second assignment in Nigeria, I had some idea of what to expect. On previous Winrock assignments, (e.g., in Mali) I taught entrepreneurship and rural agro-business development. As the College was developing a similar program, I offered a presentation of those subjects in the second week of my assignment. That course proved even more popular than grant writing. Starting with about 30 faculty and staff, I divided the group into 5 teams to find problems to solve in the agriculture sector in the state of Kaduna, develop a project to solve the problem, create a reasonable budget, and make a rough draft of a grant proposal. One member of each team make a brief presentation at the end of training, describing the team project, budget and outline for the team grant proposal. During the training, I reviewed earlier proposals written by the faculty, made comments, and returned to them with extensive notes and suggestions. I spent several hours demonstrating an internet search process to enable the participants to easily find research and target specific funders that would be candidates for funding future proposals. 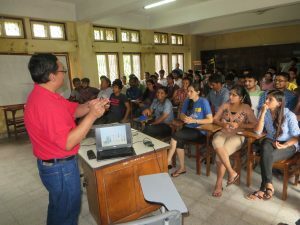 As the teams developed and presented proposals, I could easily see they were incorporating techniques from my presentation. A series of handouts guided the teams on their daily discussions, helping them to keep focused on creating worthwhile projects leading to interesting proposals. The entrepreneurship training took off from the very first day, with 45 members of the faculty, all taking notes and actively participating. We heard stories of their frustrations and failures and redirected them to more innovative and workable solutions. Breaking into teams, they worked after the training developing business models that could theoretically work in the local economy. Those models and business plans had a surprising degree of practicality and realism. The likely outcome of the assignment is that most of the faculty and administration now understand how to develop agriculture projects that are interesting to grant funders and much more likely to get funded, and how to write and format a full proposal with all the required narrative, budgets and appendices that will be competitive in the grant application process. All of this was lacking in their previous work. The entrepreneur teams similarly followed handout guidelines, and I was amazed at the animated and sometimes argumentative discussions going on as their business plans took shape. Each team had a mix of men and women, providing a balance of realism as they discussed their product development and marketing strategies. At the end, the teams made a presentation to the whole group and were critiqued by other teams. I expect several of the grant writing group will become full-time grant writers, as that skill is in great demand in Nigeria. Several of the entrepreneur projects look realistic and ready to launch. At the end of both projects, I distributed my training materials, notes, visuals and outlines such that the faculty could take these materials and build their own curriculum, so this learning experience will soon be full time courses at the College of Agriculture. Training in Nigeria presents some logistic and comfort inconveniences – rainy season, power outages, unfamiliar foods – but the Winrock staff are always focused on our safety so that the volunteers can focus on the assignments. Over the last six months, Winrock’s USAID-funded Farmer-to-Farmer (F2F) for Agriculture Education and Training (AET) Program fielded four volunteers in Mali to support the Sasakawa Africa Fund for Extension Education (SAFE)-Mali program. SAFE provides leadership for building capacity in agricultural extension. SAFE-Mali works with farmer-based organizations (FBOs) to strengthen value chains through AET training for their partners and pools of trainers. The F2F assignments with SAFE-Mali covered effective teaching, business development and entrepreneurship, marketing and competiveness, and post-harvest technologies. All the materials that the volunteers provided for the assignments have been translated into French and have been assembled in booklets to share with the FBOs through extension agents. This way, the volunteers’ trainings will be replicated, reaching many more farmers in Mali! We will look forward to following up with SAFE-Mali and the training participants to see what changes they put into action as a result of this F2F assistance.